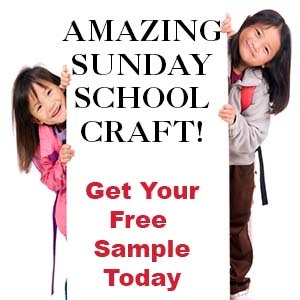 The following lesson for children is a free sample Sunday School lesson from The Resource Room. Member's - Includes everything on this page. God protects us like a mother bird protects her chicks. We don't have to be afraid because we can trust in him. 2. In class have your children color the picture. 3. You can also bring in small feathers for them to glue to the hen. Write the Bible verse on the left-hand side of the picture. 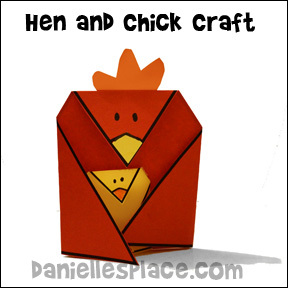 This craft comes with two patterns, a mother hen and her chick. Children color the patterns, cut them out, and fold the mother's wings down, and place the chick underneath the mother's wings. The legs and tail fold out to make a stand so the hen sits up. 1. Before class print out the red hen pattern onto brown or red paper. Or you can use white paper and let your children color the pattern if you would like. 2. In class have your children color the pattern and cut it out, and then fold down the top point to make the hen's head and beak, and fold in the two side points to make the wings. 3. Have children draw in the eyes and beak, and glue on a waddle cut from construction paper. Write the Bible verse inside the folded wings. As children work on their projects talk about feathers. Tell them to feel them and describe how they feel. Ask them if they have any down comforters or pillows at home. Ask them how it feel to wrap themselves up in a warm blanket on a cold night. Preparation: Bring in warm comforters and spread them out on the floor for the children to lay on. Wrap a comforter around yourself. (Preschool) Before the lesson play follow the leader. Place a sheet or blanket over your shoulders and around your arms to look like wings (a cape). Tell the children that you are going to pretend to be a mother hen. Spread out your arms and show them your wings. They are going to pretend to be your chicks. They are to follow you around the room and do what you do. When you say, "Cluck, cluck, cluck." They should all come and hide under your wings. Walk around the room acting like a chicken: scratch on the floor with your feet like you are looking for grain, flap your wings up and down while you walk around chairs, pretend like you are trying to fly, etc. then say, "cluck, cluck, cluck" and open your arms for all the children to come to you and give them a great big chicken hug. Have the children sit down. Have you ever watched a hen with her chicks or seen them on TV? They are really interesting to watch. The little chicks follow their mother everywhere she goes. She leads them all over the barnyard showing them where to find food and watching over them. The little chicks know not to wonder far from her. Whenever the mother hen thinks there is danger she lifts up her wings and the little chicks all come running for cover. She protects them from the wind, and rain, and heat of the sun by covering them with her wings. She keeps them warm with the heat from her body. She keeps them warm like a great big blanket. She keeps them dry like an umbrella. And she protects them from danger. Have you ever been afraid at night when you are in your room and it's really dark? I think we all have. This verse tells us we don't have to be afraid because God is watching over us. Just like a mother bird watches over her chicks. She covers them with her wings and protects them from the cold and from danger. When you are lying in bed and feel afraid you can remember this verse. 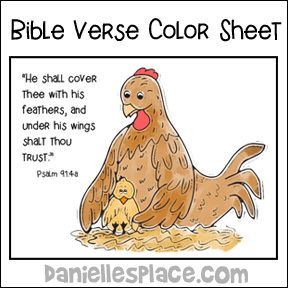 "He shall cover thee with his feathers, and under his wings shalt thou trust:" Don't you feel a little better when you have a big soft blanket to hide under? (Bring the comforter up around your face and peek out like you are afraid.) God is like that big blanket. You can ask him to comfort you and help you not to be afraid. (Did you know that some comforters are made with feathers called down?) When you hide under your blanket at night remember that God is also there with you surrounding you with his love. Do you remember David of David and Goliath? Remember how he as a young man killed the Giant with a little rock. He was very brave, but David wasn't always without fear. There were many times when he was tired and afraid, when he felt like God was far away. (Psalm 4, 6, 10, and 13). After David killed Goliath he went to live with King Saul. At first King Saul was glad to have David there. He put him in charge of a great army. David was so good that people started talking about him. They thought he was even better than King Saul. (1 Sam.18:5) King Saul became very jealous of David. He tried to kill him several times. David had to run away and hide. King Saul sent many people after David to find him and kill him. David had to hide out in the desert and in the hills. He had to keep moving to keep Saul and his men from finding him. At times he thought for sure that Saul would kill him (1 Samuel 27:1), but he knew God was on his side and that God would protect him. When he was scared or lonely he wrote and sang songs to God. Many of David's songs are in the book of Psalms. These songs comforted him and made him feel better. Do you ever sings song when you are afraid? If you are afraid, try singing "Jesus Loves Me" or another song you know. This will help you to trust God to take care of you, just like David did. 2. Make more than one copy of the pattern. Write one word of the memory verse on the belly of each chick. Hide the chicks around the room. You can tape them to the bottom and the back of chairs and on the walls, etc. After the lesson place the mother hen (use the pattern from the craft) in the center of the table (or tell them you are the mother hen). Tell the children that the mother hen is calling for her little chicks. Ask them to help the mother hen find her chicks and when they find one, bring them to you or the hen picture. When all the chicks are found have the children take turns trying to figure out the order the chicks need to be in to spell out the memory verse. If you have children who can't read or who are learning to read, ask them questions about the verse. For example, you can say, "Who has the word "he"? It starts with the letter "H". You can also write the words on the board and have the children match up their chick to the words on the board. Divide your children up into teams. Give each child a feather. Mark a starting point and an ending point. On the word go the first player in each team places his feather on the floor and uses a piece of cardboard to blow the feather across the room to the end mark and then back again. When the first player returns, the second player goes, and so on until the whole team has had a turn. The first team to have all their players cross the finish line wins. Preschool children will just enjoy trying to get their feathers across the line without touching them. His feathers will cover you. Had another great lesson to night thanks to you. I changed some things around as usual. My helper and I shared with the children some of our bedtime fears from when we were young. They thought they were funny. I took the chicks from the memory game and ran them off on yellow poster board and colored their beaks orange. Next I took the wings from the "HE covers us with His feathers' craft and enlarged them and cut them off or orange and brown construction paper, I used the head, beak, and heart shaped waddle from the "Stand up hen craft" at First school. You could use the feet to but I made my own, and half circle with 3 triangles sticking out. Cut the head out of orange or brown to match the wings, the beak out of yellow, the feet out of orange, and the heart out of red. I cut 2 one for the head and under the beak. I then took brown lunch sacks and had the children stuff them with wadded up newspaper. We fluffed them up and folded the 'neck' flat and stapled it together. Each child received a head, a beak (I folded a little crease on either side to make a flat part for easier gluing.) two red hearts for a comb and waddle, two feet, and two wings, and two baby chicks. They were given markers to make eyes and some made tongues too. They glued the mouth, waddle and comb to the head. The glue wasn't strong enough so we stapled the head to the 'neck' part of the bag. We then glued and some stapled the wings to the side of the body and they glued to little chicks to the front. They glued the feet under the bag where they stuck out. I didn't have time but it would have been cute to trace their hands a couple or three times and cut them out to attach as tail feathers. 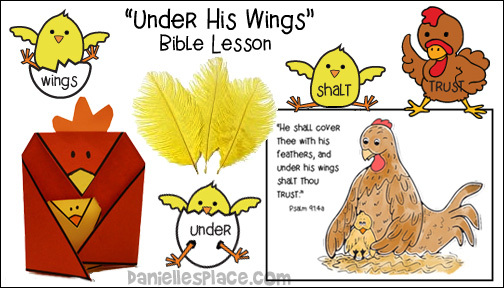 Another idea is to run off egg shapes on poster board, put the memory verse in the middle and glue it to the front of the chicken. Easter grass could be glued around the bottom for a nest if desired. They turned out really cute and the kids loved them. We did the memory verse. I said part and clapped and then the children repeated it with words and claps. We are called the Sunbeams ( We Shine for Jesus) but you could put children in there too. Here is One More Thing We Did. I found a cute activity, I can't remember where, for Thanksgiving called the Turkey Jerky. Here is how we changed it. You put your right drumstick in and you shake it all about. You put your left drumstick in (Left leg). You put your left drumstick out. You put your left drumstick in and you shake it all about. You always trust in God and you never are afraid. You put your right wing in (Right arm. Make a wing like for the turning around). You put your left wing in (Left arm). You put your left wing out. You put your left wing in and you shake it all about. You put your chicken neck in (Head). You put your chicken neck out. You put your chicken in and you shake it all about. You always trust in God and you never be afraid. You put your tail feathers in (Backside). You put your tail feathers out. You put your tail feathers in and you shake them all about. You put your chicken body in (Whole body). You put your chicken body out. You put your chicken body in and you shake it all about. 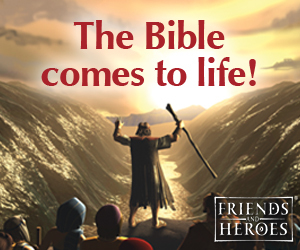 That's what the Bible says!